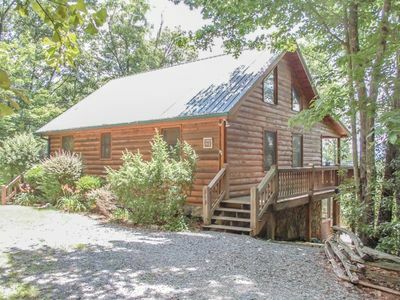 “The Bear’s Den” is located 90 minutes north of Atlanta and 8 miles north of Blue Ridge in Morganton, GA. Nestled in the woods, this secluded mountain retreat offers beautiful views of the Appalachian foothills. 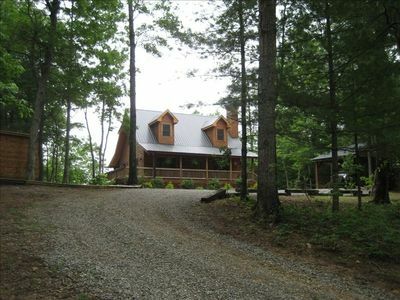 Our log cabin, built in 2007, is on approximately 4 acres. 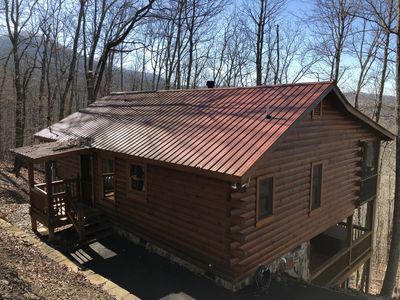 Start your morning with coffee and a cool mountain breeze in a rocking chair on the screened porch or wrap around deck. 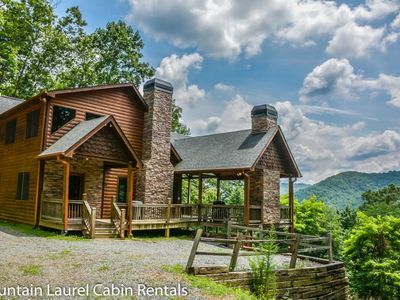 At dusk, watch the sun set behind the mountains from the swings on the patio or count the stars while roasting s’mores around the fire pit. 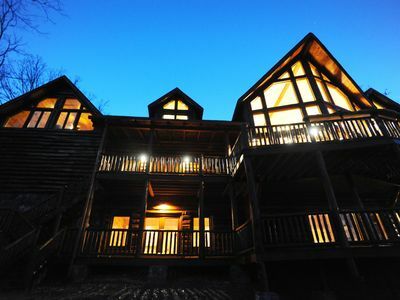 True to its name “The Bear’s Den” is a great retreat to the mountains and lake with all the comforts of home. 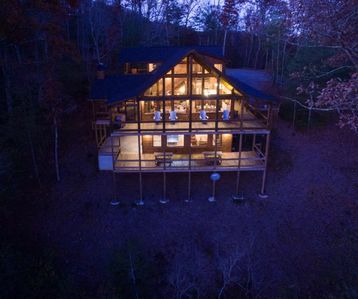 Entering on the open main level, you find a cozy living room with a wood burning fireplace (great for a romantic evening), a dining area, and fully equipped kitchen. The barrel bar separating the kitchen and living area creates an ideal spot to sit, chat, and snack on appetizers while someone prepares a hearty meal. 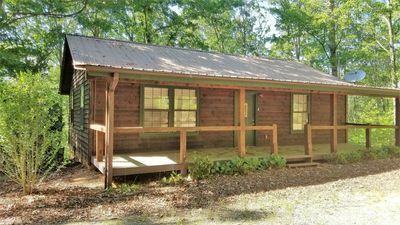 There is Wi-Fi throughout. Around the table, at the bar, or on the sofa, we are certain even Goldilocks can find the perfect seat. 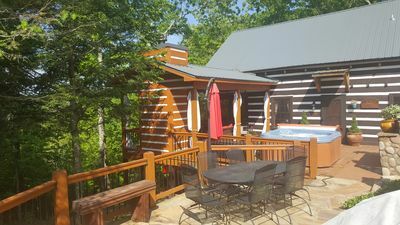 When ready to test the beds, the main level includes a bedroom with a queen size bed and bath. 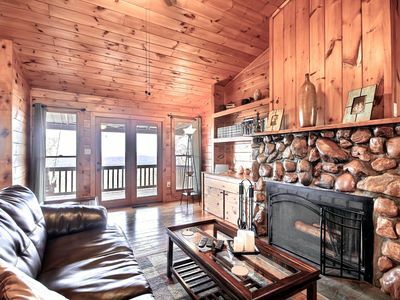 Going upstairs you will find a great loft to hibernate with a book or daydream while staring out the windows at the mountain views. 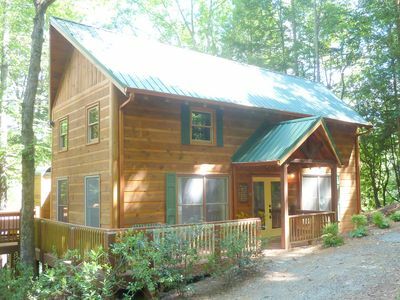 While in search of the perfect bed, you may try out the upstairs bedroom with its king size bed and bath. 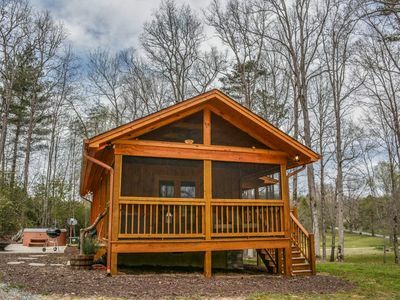 The basement level adorns a bedroom with 2 twin beds and 1 queen bed to make a family sleeping room or bunk room for the little bears to choose from, a bathroom with rain heads in the shower, and doors to a private patio. 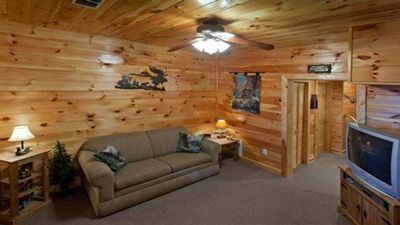 You may find this suite to be “just right”! If you don’t want to leave the “Den” on a rainy day or when the Big Game is on, the Media Room with theater seating provides big screen entertainment in reclining leather theater style seats, swivel rockers, or sofa. With a variety of DVD’s, board games, and air hockey to entertain the active cub in all of us, rainy days are not so gloomy. 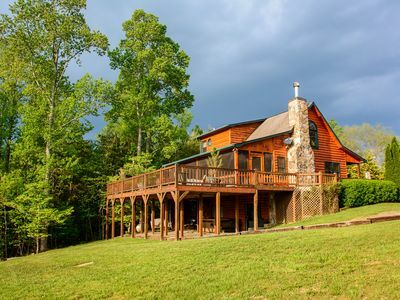 Whether you want a romantic weekend getaway, a family vacation, or a long weekend with friends, “The Bear’s Den” will provide a great secluded mountain retreat. 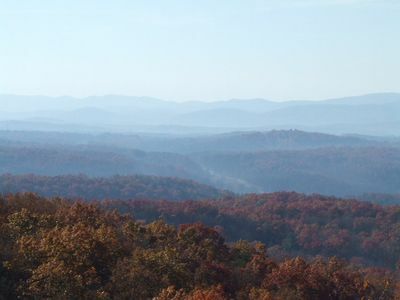 Breathtaking long range views, 3 bedroom mountain views from almost every room.